High Time, a fresh new trio from the heart of Connemara, Ireland combines Irish music and an intriguing blend of modern folk influences to produce a rich sound and exciting experience to delight listeners. 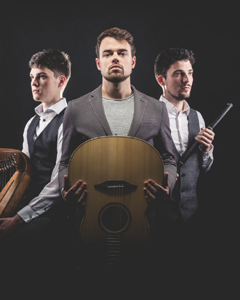 Equal measures of music and tradition from old Ireland coupled with bold new arrangements make for a tasty platter of story, music, song and dance from these three young men. Ciarán Bolger (guitar and vocals), Conall Ó Flatharta (flute, whistle & vocals) and Séamus Ó Flatharta (Celtic Harp, whistle, bódhran drum, Irish dancing & vocals) all hail from the village of Ardmore on the rugged west coast.